Rep. Keith Ellison, the deputy chair of the Democratic National Committee, is fending off allegations he abused an ex-girlfriend, just days before he is slated to face other Democrats in a primary election for attorney general in Minnesota. The accusations surfaced Saturday, when his ex-girlfriend’s son said on Facebook that he had seen text messages from the Minnesota Democrat threatening his mother and a video showing Ellison dragging her off a bed by her feet while screaming obscenities. 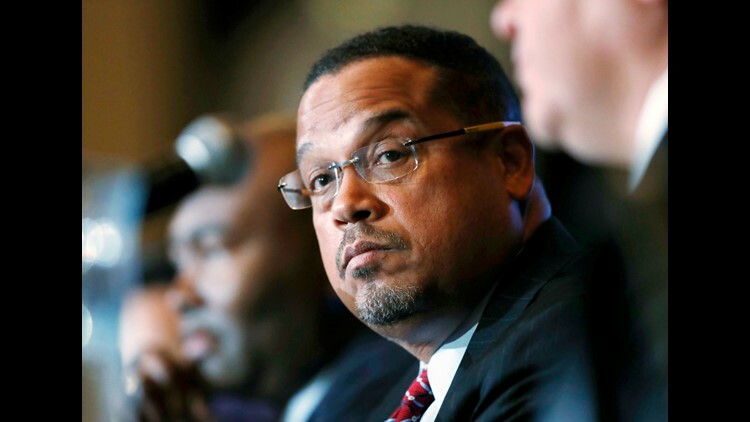 The former girlfriend, Karen Monahan, tweeted Sunday that “every statement” her son made was “true.” Monahan, a political organizer in Minnesota, has been vocal about the #MeToo movement and previously tweeted about being a victim, but had not mentioned Ellison's name until this weekend. Minnesota Public Radio reported Sunday that a review of more than 100 text and Twitter exchanges between Ellison and Monahan revealed sometimes friendly and at other times more combative relationship as they spoke about the terms of their breakup and the emotional pain he had caused her. “There is no evidence in the messages reviewed by MPR News of the alleged physical abuse,” MPR reported. Ellison is a divorced, six-term congressman who announced this summer he would not seek re-election and would run instead for state attorney general. He has been considered the favorite to win Tuesday’s primary, when he is facing off against four other Democrats. Kim Ellison, Keith Ellison's ex-wife, defended him Sunday in a statement that was emailed to reporters, MPR reported. "We may be divorced, but we are still a family," she said. "I want members of our community to know that the behavior described does not match the character of the Keith I know."